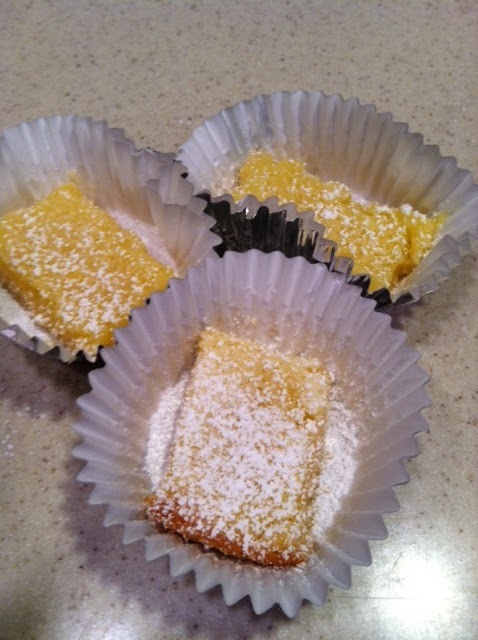 The Helpful Home: Lemon Bars Recipe--yummy and easy to make! Light, tasty, and so easy to make! These lemon bars will be a hit with any crowd! Combine flour and powdered sugar; cut in butter until crumbly. Press onto bottom of lightly greased 9x13" pan. Bake at 350 for 15 minutes or until golden brown. While crust is baking, combine topping ingredients and mix well. Pour over baked crust (crust need not be cool) and return to oven. Bake 20-25 min or until light brown. Don't overbake. Cool. Cut into bars. Sprinkle with powdered sugar.